Marie Corelli. WORMWOOD: A DRAMA OF PARIS. 3 Vols. Richard Bentley & Son, London, 1890. I was thinking about Marie Corelli recently because I had a request for stock from someone setting up a bookshop in Nigeria. He wanted biographies of great men -Einstein, Churchill and Bill Gates were mentioned, popular fiction esp Puzo, Dan and Sandra Brown, Sheldon, Nora Roberts, Silhouette books and the great Ludlum. 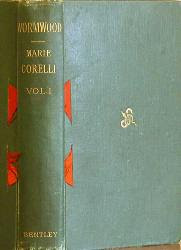 However top of the list and most wanted was Marie Corelli ( ' We would not mind any quantity of books/fiction under Maria Corelli, particularly, “The Sorrows of Satan” '). I wrote back saying I couldn't help much, but advised a buying trip to our shores. Nigeria is a bit of a no-no for the wise entrepreneur. This novel 'Wormwood', possibly her most valuable book, appears first in 3 vols (a 'three decker') and the first state came with red ribbons sewn in at at the sides of the front hinges which have almost always perished or exist only as a remnant. A copy wrapped in brown paper from day one might still have them in pristine condition. The great Victorian fiction collector Robert Lee Wolff wrote "When I was starting out as a collector I once saw for sale a copy of WORMWOOD with the crossed red ribbons on the spines. Most of the copies printed, destined for circulating libraries, were plain. I did not buy it because one of the ribons had been torn. I have never seen one since." Pic of ribboned copy on right. Although not in Bleiler, and not really her scarcest book 'Wormwood' appears to be her most expensive book. Some of her late books and her ghost stories are more elusive. 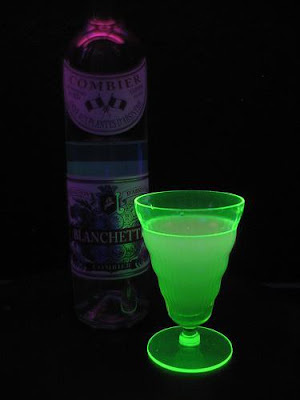 'Wormwood' is partly about the absinthe craze, it recounts the degeneration of one Gaston Beauvais, a promising young Parisian man who, betrayed by his fiancée and his best friend, becomes addicted to the pale green liquid. A reader at Amazon opines that the book is ' an important contribution to the literature of fin de siècle decadence' but Marie was not quite in the class of Ducasse, Huysmans or Wilde. On the subject of the divine Oscar, while in Reading Gaol a friendly screw bought him some Corelli to read; having tried to read her he said "Now don't think I have anything against her moral character...but from the way she writes she ought to be in here." Oddly enough the sale of her house contents at Stratford upon Avon in 1943 was rather like the hideous sale of Wilde's belongings in the 1890s at Tite Street - with a jeering auctioneer and prices laughably low. VALUE? There is one copy on the web at £875 and it has a suggestion of red ribbons. A not unthinkable price. I actually have a customer for this book (a collector of alcohol related material) and would pay £500 at least for a decent 3 vol copy -so please check out attics and steamer trunks etc., The American one volume 1890 edition is worth considerably less, an unpleasant sounding copy of what might be a first (at a mindblowing £425) is described thus 'Good - Collectible/No Jacket - Description: Privately Owned Burgandy Cloth Hardcover, privately owned, no highlighting, no underlining, no extra markings, no written notes and no folded pages. 327 pages, Drop shipping, no problem!...My book sellers group specializes in ACCURATE DESCRIPTIONS.' I guess the guy normally deals in text books. OUTLOOK Pretty good, 3 deckers are always very impressive, usually uncommon and still underpinned with a good body of collectors + absinthe has apparently made something of a comeback with modish young topers.